Kick off your visit on the 13th (Tue): take in the spiritual surroundings of Vik Church, take in the dramatic natural features at Mýrdalsjökull, then take in the dramatic natural features at Sólheimajökulll, and finally take an in-depth tour of Skogar Museum. For where to stay, other places to visit, ratings, and other tourist information, use the Vik trip planner . Barcelona, Spain to Vik is an approximately 12-hour combination of flight and bus. You can also do a combination of bus and flight. The time zone changes from Central European Time (CET) to Greenwich Mean Time (GMT), which is usually a -1 hour difference. When traveling from Barcelona in November, plan for much colder days and slightly colder nights in Vik: temperatures range from 5°C by day to 2°C at night. Cap off your sightseeing on the 13th (Tue) early enough to travel to Hof. Kick off your visit on the 14th (Wed): take in the architecture and atmosphere at Hofskirkja Church, contemplate the waterfront views at Fjallsarlon Iceberg Lagoon, kick back and relax at Diamond Beach, then admire the sheer force of Svartifoss Waterfall, and finally appreciate the history behind Skeioara Bridge Monument. To see other places to visit, traveler tips, and other tourist information, read our Hof tour itinerary planner . Traveling by car from Vik to Hof takes 2 hours. November in Hof sees daily highs of 4°C and lows of 0°C at night. Wrap up your sightseeing on the 14th (Wed) to allow time to travel to Reykjahlid. 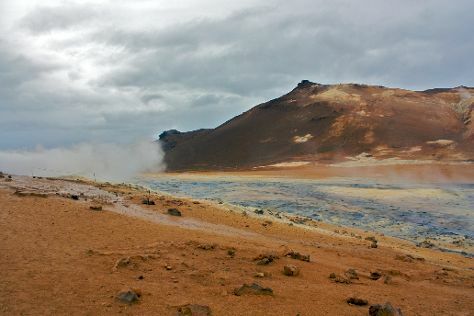 Start off your visit on the 15th (Thu): take in the pleasant sights at Viti Crater, then identify plant and animal life at Krafla Lava Fields, and then take your sightseeing to a higher altitude at Mt. 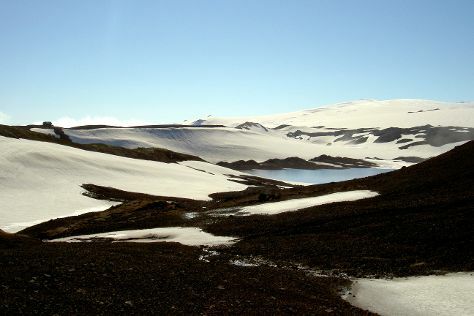 Namafjall (Namaskard). Keep things going the next day: take in the dramatic scenery at Hverfjall, then explore the striking landscape at Mud Pots, and then witness a stunning natural landmark at Hverarond. To see traveler tips, other places to visit, photos, and more tourist information, read our Reykjahlid itinerary planner . Getting from Hof to Reykjahlid by car takes about 6 hours. Traveling from Hof in November, plan for slightly colder nights in Reykjahlid, with lows around -3°C. Wrap up your sightseeing on the 16th (Fri) to allow time to drive to Akureyri. Start off your visit on the 17th (Sat): pause for some serene contemplation at Catholic Church (Katholska Kirkjan), then get a new perspective on things with Boat Tours & Water Sports, then take in nature's colorful creations at Arctic Botanical Gardens (Lystigardurinn), and finally pause for some serene contemplation at Saurbaejarkirkja. To see more things to do, photos, and tourist information, you can read our Akureyri trip itinerary planning site . Getting from Reykjahlid to Akureyri by car takes about 1.5 hours. Other options: take a bus. In November in Akureyri, expect temperatures between 3°C during the day and -3°C at night. Finish up your sightseeing early on the 17th (Sat) so you can travel to Reykjavik. Kick off your visit on the 18th (Sun): get engrossed in the history at Reykjavik Open Air Museum, examine the collection at The Settlement Center, then head off the coast to Videy Island, and finally enjoy the sea views from Grotta Lighthouse. Get ready for a full day of sightseeing on the next day: stroll the grounds of Cemetery Holavallagardur and then explore the activities along Lake Tjornin. To see ratings, maps, traveler tips, and tourist information, refer to the Reykjavik road trip planning tool . Traveling by flight from Akureyri to Reykjavik takes 2.5 hours. Alternatively, you can do a combination of flight and bus; or drive. Plan for a bit warmer nights when traveling from Akureyri in November since evenings lows in Reykjavik dip to 0°C. Wrap up your sightseeing by early afternoon on the 19th (Mon) to allow time for travel back home.